Before proceeding to Java interview questions on Multithreading let’s discuss something about some facts about multithreading. #1 – So we should know first what is the thread? It is the smallest unit of processing a particular work is called a thread. It is a lightweight in nature so easy to use. Now it comes to our mind that why we should need it, multithreading is used to achieve multitasking. Multitasking could be achieved in another way also and it is known as Multiprocessing. However, multithreading is more popular and it is efficient to use over multiprocessing because threads have properties that it uses a shared memory area whereas in case of multi-process it consumes a lot of memory and other resources which is not efficient. So the process of executing multiple threads simultaneously to do some work is called as multithreading. Threads work independent so it is independent of other operations going in the systems and thus it is possible to perform multiple operations at the same time. Time consumption is less with the use of multithreading as many operations can be performed simultaneously. Threads are independent as discussed already, so an exception occurs in a single thread will not interfere with the operations of other threads. Cost of communications between two thread is low. NOTE: As we are discussing multithreading so we will focus on Thread based Multitasking. NOTE: For your reference and better understanding go through the below image carefully. #2 – How threads are created? In a new call stack, a thread will be created. The thread changes its state from New to Runnable. When the thread will be started its finds the run () method and then it will execute. NOTE: Please mind the difference in the above two examples. The main difference in the above two examples is that if we do not extend Thread rather we try to create Thread by implementing the Runnable interface and class the start () method to start the Thread then the Tread will not be created in a new call stack as it will not be identified as a Thread. So to make it identify as Thread we have to pass the instance of the Class where we have implemented the Runnable Interface as an argument to the constructor of the Thread class and then we have to call the start () method. As they all know that schedule means to do a plan a task at a particular time. Thread Scheduling is a similar mechanism of scheduling a particular thread which maintains some protocols. There are two different ways by which Thread scheduling works in Java. JMV decides the highest priority task and starts execution until it enters the waiting or dead states or a higher priority task comes into existence. JVM start executing a particular thread for a specific time period and then move the same thread to the pool and choose other thread based on priority and other factors for executions. This process continues until all the thread ends its process. Now, if you are looking for a job which is related to Java Multithreading then you need to prepare for the 2018 Java Interview Questions on Multithreading. It is true that every interview is different as per the different job profiles. Here, we have prepared the important Java Interview Questions and answers on Multithreading which will help you get success in your interview. This first part covers the basic Java Interview Questions and answers on Multithreading. Q1. Differentiate between Process and Thread? A process is a program or application whereas Thread is a single task to be executed within a process. The thread is a lightweight whereas the process is heavyweight. Thread requires less whereas Process requires more resource thus it is termed as heavily weighted in nature. Q2. Differentiate between user Thread and daemon Thread? A thread created in java is termed as User Thread. A Daemon Thread always runs in the background and its complete life cycle depends on the main thread. A daemon thread running in the background will not prevent JVM from terminating it. Child thread created from a daemon thread will also be a daemon thread. Let us move to the next Java Interview Questions on Multithreading. Q3. The different way of creating a Thread in Java? Q4. What is the lifecycle of Thread? Q5. What happens if we call run () method of a Thread class? Calling the run () method directly will compile and execute the program successfully but the same program will not be treated as Thread because no new call stack will be created and the program starts its execution in the same call stack where the main is running. For creating Thread which should run with a new call stack one have to use the start () method of Thread class. 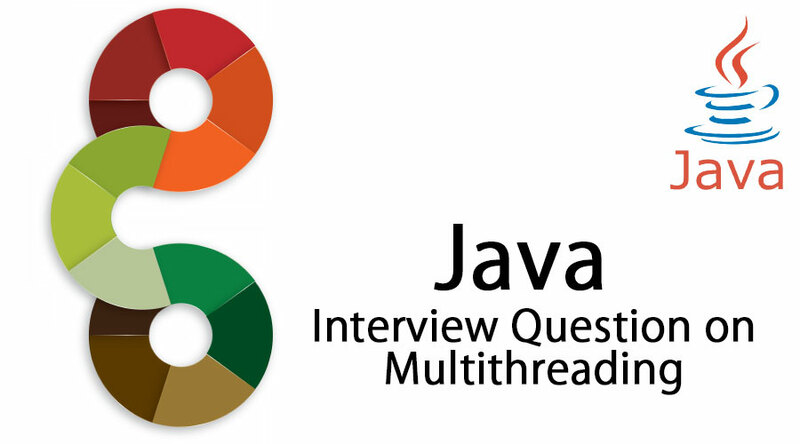 Let us now have a look at the advanced Java Interview Questions and Answers on Multithreading. Q6. Can we pause the execution of a Thread on a specific time? Yes, this can be achieved in java by calling the sleep () of the Thread class. Sleep () method also take an argument which indicates time in milliseconds. Q7. How we can achieve scheduling of thread in java? 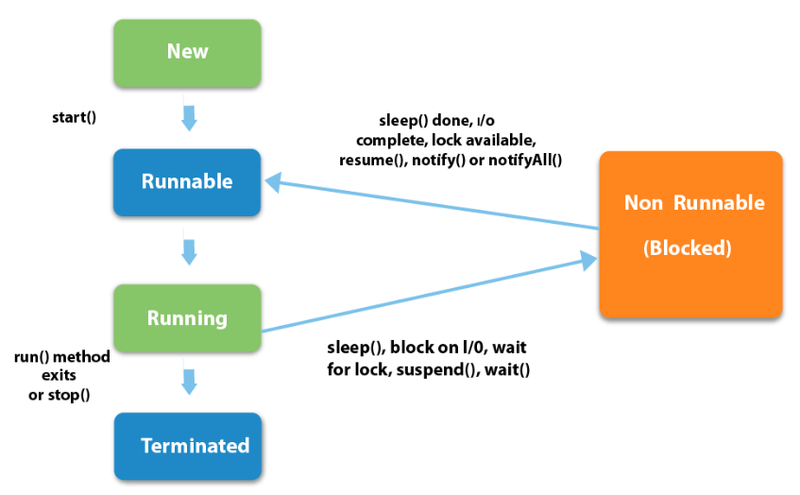 Yes, thread scheduling in java is possible. Threads in Java can be scheduled in two ways i.e. Time Slicing and Pre-emptive Scheduling. Q8. Can a Thread be started twice? No, a thread cannot be started twice. If we try to start a thread twice it will throw “java.lang.IllegalThreadStateException”. Q9. What is shutdown hook in Java? This is the most popular Java Interview Questions on Multithreading asked in an interview. A shutdown hook is a mechanism which is used for clean-up resources when the JVM shut down normally or abruptly. Volatile is a keyword in java and it can be used with variables. If a variable is declared as volatile all the threads will read the value of the same variable from the main memory rather than from the cache thus it prevents error read when multiple threads use the same variable in their operations.